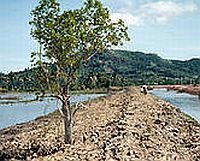 Mangrove destruction for shrimp farming in Thailand. May 29 (IPS) – Build a shrimp farm in Thailand by cutting down mangrove forests and you will net about 8,000 dollars per hectare. Meanwhile, the destruction of the forest and pollution from the farm will result in a loss of ecosystems worth 35,000 dollars/ha per year. Many leading development institutions and policy-makers still fail to understand that this ruthless exploitation for short-term profits could trigger an Enron-like collapse of “Earth, Inc.”, experts say. For example, the World Bank and other economic development agencies would happily loan a shrimp farmer 100,000 dollars to clear more mangroves. All economies depend on the natural capital lying within nature’s lands, waters, forests, and reefs, but humans have often treated them as if they had little value or were inexhaustible. “Up till now, humans have been exploiting natural capital to maximise production of food, timber, oil and minerals at the expense of soil, water and biodiversity,” said Janet Ranganathan, director of people and ecosystems at the Washington-based World Resources Institute. “Usually only a few people benefit from this exploitation,” Ranganathan, who co-authored a new report called “Restoring Nature’s Capital: An Action Agenda to Sustain Ecosystem Services”, told IPS. Worse still is that this approach to nature is extremely destructive and short-sighted, she said. Since 1980, nearly 35 percent of the world’s coastal mangroves have been cut down, most often for shrimp aquaculture. Vietnam, for example, has lost over 80 percent of its coastal mangroves to such operations. The 2004 Indian Ocean tsunami that killed nearly 230,000 people provided ample evidence that mangroves can protect or at the very least buffer communities from the worst impacts of tidal waves and storms. Unfortunately, that particular “service” is not captured or valued by the marketplace, said Ranganathan. Nor does the market value the vital role mangroves play as a nursery habitat for marine life, crucial to the health of offshore fisheries, or the service they provide filtering pollutants which in turn protect coral reefs, another important nursery for fish. Ignored as well are the substantial economic benefits mangroves provide in preventing the shoreline erosion that is threatening many coastal countries like Thailand, where the shoreline is retreating 25 metres each year in some areas. Nature’s services, which are as real as any shrimp platter, are simply left out of the current economic system. Also ignored are the environmental and social costs of shrimp farming such as water pollution, land degradation and impacts on local fishers. After five years, the water is too polluted to raise shrimp and the operation moves down the coast. Such operations are often subsidised directly and indirectly with nominal land rent, taxes and even development grants and loans. When the real costs of shrimp aquaculture are taken into account, its value is 5,443 dollars per hectare, according to an in-depth analysis. Meanwhile, the real value to society of intact mangroves is a whopping 35,696 dollars per hectare.